Hey everyone! Finally decided to join TFP after following several threads on here . I've learned a lot of good stuff over the past several weeks from this forum. Now I need some help. For the past 3 months I've been battling some sort of mustard algae/pollen that won't go away. I removed the lights/stairs, vacuumed, and brushed before shocking the pool overnight and raised the chlorine to about 40ppm (Based on the pool math calculator. I didn't have a kit that read high chlorine levels at the time). I did this for two days scrubbing at least 4x a day and the pool was crystal clear. The next day the mustard/pollen algae came back slowly collecting at the bottom of the pool. Now, there's a good amount at the bottom. I decided to buy a TF-100 kit to follow the SLAM recipe as close as possible. Instead of vacuuming this time I scrubbed the entire pool at night (11:30p.m. ), and raised my FC to about 33ppm. I checked my chlorine again in the morning(8:00a.m.) and my CC was ~1.0ppm , and my OCLT was ~1.5ppm which sounds reasonable, but the whole pool was covered again in algae/pollen. 1. 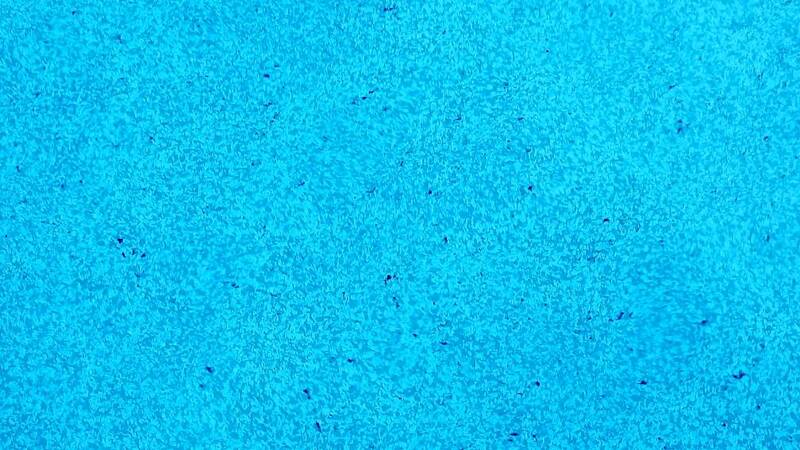 Would pollen settle down at the bottom of the pool? I've read pollen only floats. 2. Can it be mustard algae even though I was at mustard algae levels? I heard algae won't grow at these levels. 3. Could it be dead algae pouring out of the sand filter even though I backwashed/rinsed? Sorry if I missed any details. I'm still learning as I go. Hello and welcome! Okay, so you are seeing what many of us are right now .... LOTS of debris floating around and falling onto our cars and in our pools. I suspect much of what you see floating around is simply the remnants of stuff blooming like crazy, then it quickly gets waterlogged and sinks. Do you have algae as well? Perhaps, although a good overnight (OCLT) test might be in order so that you aren't just SLAMming for no reason. Mustard Algae (MA) is not as common as many think, and it's fairly stubborn by finding a place to dwell in the shade. Even if it was MA, a normal SLAM is a must first. What I would recommend first is to do an overnight test. Pool School - Perform the Overnight FC Loss Test (OCLT). Now if we round-up your CYA to 60, a SLAM level is only an FC of 24. So before you do anything else, let the FC fall on its own this evening. Don't attempt the OCLT until your FC is back to SLAM level - 24. or below. When you are WAY over your designated SLAM level, it is easier to fail an OCLT. So let the FC drop a bit. Next, please add all of your pool info (cut & paste) to your actual profile signature and check the box to "show on all posts". Good job getting the TF-100! I would still encourage you to keep the pool swept, brush if you can, and backwash when the pressure increases by 20-25% from your "clean" starting pressure. Ignore the pH tests when your FC is over 10 as it indicates a false high reading. We'll confirm pH later. Just focus on the FC only for now. Once you are able to do the OCLT, let us know how you did. Hope that helps, and great to have you with us. PS - Please include your city location on your profile As we all know, Texas is BIG. So environmental conditions vary greatly from El-Paso to Tyler, from Dallas to Corpus Christi. I didn't continue the SLAM because the next morning my pool was filled with the brown substance even though my OCLT was 1.5ppm and my FC was 30ppm. Yes! Let me fix my signature. I do have several trees around the pool, but not hanging over it. About 30ft away. It seems to be worst when the pump is running. Any reason why that could be? Here are some photos. The 1st photo is running the pump for 8 hours. Its difficult to see the bottom. It doesn't look black like the picture shows, but brownish. I'm trying to get better pictures. The 2nd photo is not running the pump overnight, which looks good. That looks dark blue to purple. It does not look like mustard algae but I don't know what it is. Maybe a better picture would help. 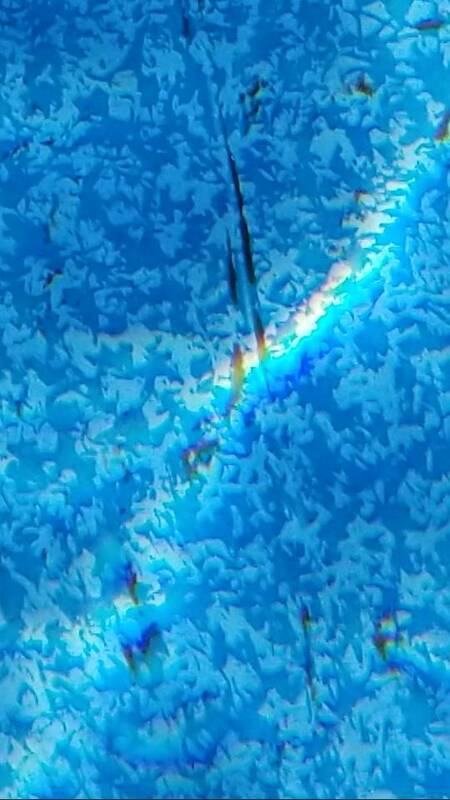 Here are some zoomed in pictures.. You can see in the light it's kind of brownish. That's how all the spots look like. How do people take pictures? My keep coming out dark, even in sunlight. You mentioned in post #1 that the debris "collected at the bottom", and you also hinted that you tried to grab it but it just disintegrated. Is that still true? Do those colored marks on the bottom move when you brush - like float away? Or are they stuck like a stain or something very aggressive? It still disappears when I grab it. I tried grabbing a piece to bring it up to the surface and take a photo, but it just dissolves. Yes, if I brush it will form a brown cloud and disappear. I don't even need to brush. Just swinging my hands to create air pockets underwater will make it disappear. Then you appear to have good old fashioned algae. Anything else would be stuck or much more aggressive. At first I considered pollen, and some of it may be pollen that sunk, but I recall you previously stating on an OCLT you lost about 1.5 FC overnight, so that is another indicator. If I were you, I'd do a complete SLAM (link below) and follow that thing closely until you definitely pass all 3 criteria (crystal clear water, no more that 0.5 CC, and pass the OCLT with no more than 1 ppm of FC lost). Your water is otherwise clear, so if you stick to it, you might not have a long SLAM. But make sure to follow everything on that page. Lower your pH to 7.2 first, then increase your FC to the proper Shock/SLAM level for your current CYA as noted on the Chlorine/CYA Chart (link below) and re-test the FC often to maintain it. Good luck! It's probably type II mustard algae. It has the characteristic brown with yellow tint. So I started the SLAM process yesterday night. First thing I did was vacuum the algae. 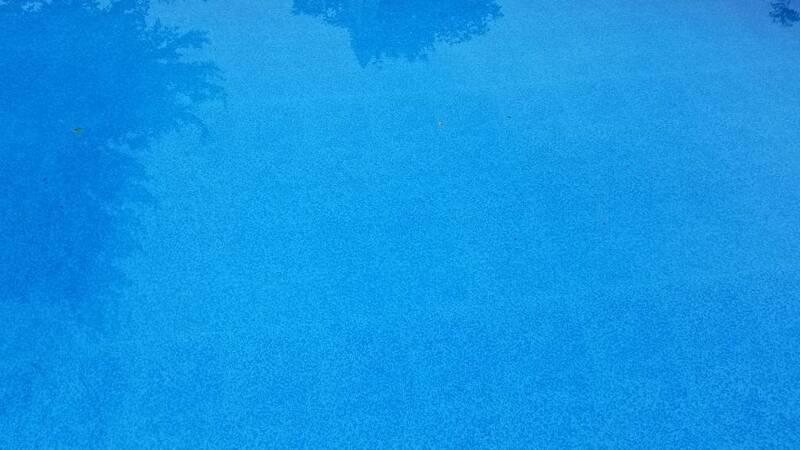 05/01 9:00a.m Scrubbed entire pool. Still had lots of algae. 05/01 5:00p.m. Scrubbed pool. Mustard algae still present. Scrubbed entire pool and noticed less algae. 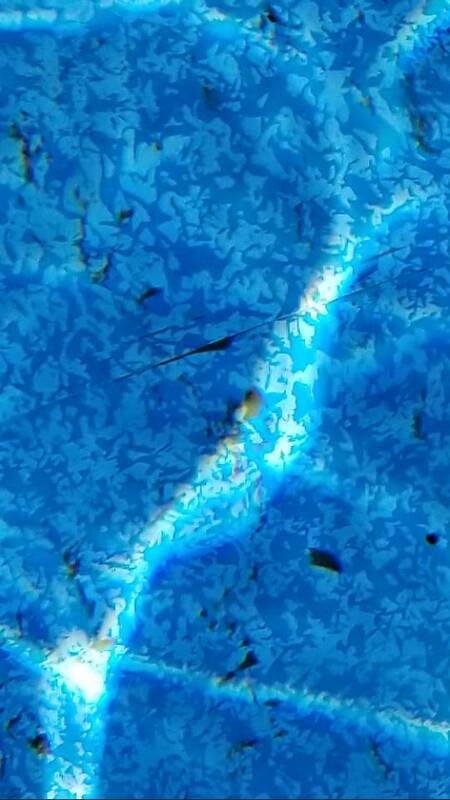 Scrubbed entire pool and noticed a significant drop in algae! About 80%. I'm hoping tommorrow morning algae will drop a considerate amount. I'm really glad I'm seeing improvements after a year of trying different methods like yellow out, copper algaecide, switching out the multiport valve, replacing sand, and vacuuming intensely . Stay with it. You're doing well. So I've been keeping the water at mustard algae level.. 25PPM for 5 days.. I still see about 10% left. Should I continue or should I follow your advice of two weeks at 20%? I would go to 30 ppm for a day or so to get it down to zero algae. Does the algae have any color? There's about 10% left for the past day, and hasn't gone away. I decided to vacuum today since we got some good rain. I'll raise it to 30ppm tonight. It should die out soon. I would keep hitting it as hard as necessary until it's 100% gone. Did this situation resolve itself? Was is mustard or pollen or just plain old algae?